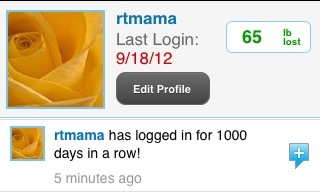 Today marks the 1000th day of login days at MyFitnessPal! Even though I am in weight-loss maintenance, for me, it’s important to continue logging my daily food intake. It keeps my calories and other nutritional data on track and since my diary is open to my MFP friends, it keeps me accountable. I weighed in this morning at 136 pounds. Yeah, that’s a bit too low I think. I’m happy with 137, 138. I think it’s time to increase the calories back up to 1700 or 1800. I’ve been doing okay keeping to around 1650, give or take a few calories. I’m just happy to be back on track! Went to the doctor’s for my annual physical yesterday, blood pressure is 120/77, and I’m on my way to have my fasting blood test this morning. I’m looking forward to seeing my numbers, especially my vit D, as I’ve been taking 5K four times per week. UPDATE: raised calories to 1750, a little less than the 1800, which was what I was previously eating while in maintenance. UPDATE September 27, 2011: I’m up to 137 pounds. I like this weight! I weighed in again this AM. I was a bit nervous actually. I thought perhaps yesterday was a fluke and maybe I was back up. Funny my body “felt” thinner when I was heavier at 141.8 and this morning, I “felt” heavier. But yay, the scale showed 138.6. I’m definitely feeling back to normal. I am pretty sure it’s really not possible to gain and lose 3 pounds of actual fat in such a small amount of time, so I assume my slight weight gain and loss was due to some sort of water retention. Hmm, possibly from the rise in activity too. I’ve been working with DH moving and stacking firewood, and we’ve been walking and biking more too. I think I heard somewhere that you can have a temporary weight gain when you’re working your muscles. Don’t they hold in water or something? I’ll have to do some research. Anyway, I really think I’m back on track. 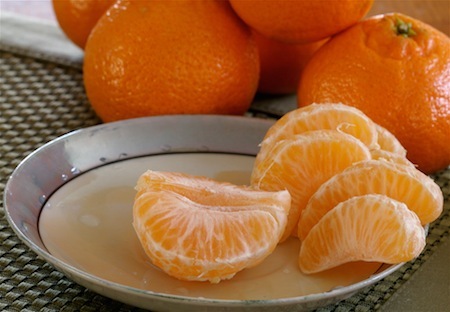 I’m back to eating “clean” and it feels wonderful! But the slightly lower calorie restriction has been a little bit difficult. I’ve definitely been keeping under my lower 1650 calories, but it’s been a challenge. I’m thinking I’ll wait one more day or two, weigh in, and then incrementally raise it back up to 1800 during the following week or so. This summer was brutal. While on our vacations, I ate a lot lot lot of sugary foods, & it seems like it made my “compulsive” eating issues come alive a little bit. It was getting harder and harder to say “no” to foods that I shouldn’t be eating. This weekend, I didn’t think twice about grabbing a couple of processed store-bought cookies & a small bag of buttered/salted popcorn that was offered at a local hardware store’s grand re-opening. ugh. I never had trouble refusing gross processed cookies in the past, so I know there’s a problem. I mean, I always felt that if I was going to treat myself, it would have to be something special and really delicious. Not some store bought oreos, chips ahoy, or fig newtons! sigh. Bottom line, I have been slowly gaining back a little weight. Not a lot, but I’m up to 141.8! I think the gain is a combination of my eating habits and my messed up peri-menopausal system, but either way, I’ve got to do better with my food choices. I’ve officially adjusted my profile weight up to 141.8 at MyFitnessPal. I adjusted my daily calories from 1800 to 1650, and posted my confession on my MyFitnessPal newsfeed! What a marvelous wonderful group of supportive friends I have on MFP. Yes yes yes, I know I can do it! I don’t want to ignore this problem, that’s how I ended up at 200 pounds in the first place! I’m admitting that I’m doing something wrong and I want to change! I should add that 140 is actually a “normal” weight for someone at my height of 5’8″ but I feel “normal” at around 138ish. No, NO NOO. I Am NOT Gaining! So, I’ve been weighing myself regularly (once or twice weekly +) and this AM I was shocked to see 141.6 on the scale! I haven’t been that much over 140 since April! I was 139.6 last week. I admit a couple of days, I went over by 100-200 calories, but there were days I was under. I suppose I also should admit that I have been “nibbling” and not “counting” a little bit while cooking. BUT I’ve also been active, walking/biking and running around the kitchen cooking. I know I didn’t actually gain 2 pounds of fat, but I think I am retaining some water. Last night, my ankles looked very puffy. I know I’m not drinking enough water. And I’ve got to stop the mindless nibble while cooking. I do not want this to be a permanent thing, and I am pretty sure it’s not, but it gave me a little push to watch myself closer. And I’m trying to be accountable! I’ve been a little lax and maybe even a little cocky about my calories. There’s nothing to be ashamed of, I just need to stop now, and re-focus. Autumn is a time to revel in the crisp clean air and ponder life. Yes, I’m happy, I have a wonderful husband, great family, lovely home. I’m lucky. I’m healthy. I’m looking forward to hitting 50 next year! Life is good! Author debbie @ That's Just MePosted on September 6, 2011 Categories Weigh inTags feelings, FOOD, gaining, healthy, Weigh inLeave a comment on No, NO NOO. I Am NOT Gaining! Well, since I’m on a nice “high” from my size 8 jeans purchase at LL Bean, I decided to dig out an old pair of high-wasted acid washed jeans from the 80’s. I held them up, and thought no way. They won’t fit, but guess what, they did! Whoo hoo! I couldn’t believe it. I looked at myself in the mirror, and wow, I still couldn’t believe it. I felt so lean and thin! I also found a beautiful old embroidered skirt that belonged to my mother when she was a young adult, and that fit fairly well. It was a little too tight in the waist, but I still was thrilled! I wish I didn’t give away all my clothes from years past. I wonder if I have any more boxes in the attic! I know I had some dresses, pants, blouses, sun dresses, etc. that would probably fit nicely now. Darn! I missed my 2 year anniversary! It was on Wednesday the 20th, I thought it was the 23rd! Oh well. What’s important is I made it though another year. 2 years ago, a friend posted an inspirational quote on her Facebook profile and it profoundly altered my life forever. God grant me the serenity to accept the people I cannot change, the courage to change the one I can, and the wisdom to know it’s me. I had been thinking of a change to a healthier lifestyle, but every time I tried, it never worked out. I always got side tracked by tempting sugary, processed foods. When I saw the quote on her wall, it “spoke to me” – I knew it was now or never. So, here I am! I’ve lost 60+ pounds, and at 137-140 pounds and a size 8 jeans, size medium top, I’ve never been healthier! I follow the Mark Bittman / Michael Pollan philosophy of eating a higher-quality, but less-quantity of meat, and focusing on more plant-based whole foods. Although, I do believe it’s absolutely necessary to regularly allow myself a decadent “treat”, I try to stick to healthy whole clean foods: vegetables, fruits, beans, grains, with humanely raised meat, dairy and eggs. During this time, I’ve learned a lot about myself and my body. Some days were horrible, where insecurities got the better of me. I read a lot of good books, and learned a lot about nutrition, the environment, and how to live a happy, healthy lifestyle. And I think most importantly, I’ve discovered my limits. I now know that I am a compulsive food eater. I know I won’t cure my compulsion, so I’ve learned how to live with it, and it’s working! All in all, Life is good! And I’m so grateful! Author debbie @ That's Just MePosted on July 22, 2011 Categories Personal Challenges, Weigh inTags anniversary, feelings, healthy, inspiration, Weigh inLeave a comment on My 2 Year Anniversary!